Motorola has recently announced the Moto G, a wide-ranging model sold on Motorola’s online store directly to customers without a contract for $179. 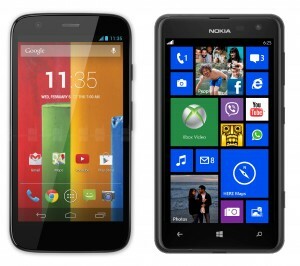 Lumia 625 shares the price range with the Moto G, but are they really comparable? The design is quite similar in both models. Both have a lot of colorful and bright shells, with a gentle curve to the back for an easy hold. We can found the first clear difference in the display. Although they have similar sizes (4.5-inch for the Moto G and 4.7-inch for the Lumia 625), they have different resolution. Motorola has a 1280×720 resolution panel, while Nokia offers a much modest 800×480 resolution. It doesn’t look bad, but the comparison makes the Moto G stands out. The rest of the specifications are quite good for both devices. The Moto G has a quad-core Snapdragon 400, 1GB of RAM and 8 or 16 GB of internal storage. The Lumia 625 has a dual-core Snapdragon S4, 512MB of RAM and 8GB of on-board storage. And both have a 5 MP rear camera and a simple front-facing one. The Moto G includes slightly better specifications, but the Lumia has some good features to be taken into account: it has a microSD card slot, LTE and super sensitive touch display (you can use the phone with gloves on). The softwares are two worlds apart. The Moto G runs Android 4.3 while the Lumia 625 runs Windows Phone 8. Both have the latest versions available of their respective OS (Moto G will have KitKat on January) and both have a large amount of apps in their respective app store. To sum up, both phones are really good for their price. You can choose any of them and you won’t be disappointed. However, if you like Android mobiles, the Moto G is the best one you can find for this price.